Miss apple pie season? Love fried onion rings and want a dessert version? Looking for a new treat to delight your family? 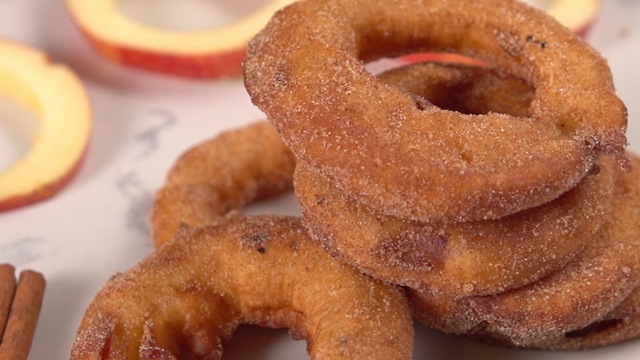 Whatever your reasons for looking for a new recipe might be, these Fried Cinnamon Apple Rings fit the bill! They’re the perfect combination of sweet and crispy, bringing a little bit of fall back into winter for a dish that’s as fresh as spring. Check it out! In a medium-sized bowl, add the flour, baking powder, sugar, salt and ¼ teaspoon cinnamon. Set aside. In a small bowl, combine the egg and buttermilk and mix well. In a third dish, mix the remaining ⅓ cup sugar and 2 teaspoons of cinnamon and reserve for topping. Slice apples into ¼-inch slices. Using a biscuit cutter, remove the cores along with the seeds, leaving ¼-inch-wide rings. Pat the apple rings dry with a paper towel to remove excess moisture. Over medium-high heat, heat the vegetable oil in a frying pan to 350 degrees Fahrenheit. As the oil heats, combine the flour mixture and the buttermilk mixture together into the batter, mixing well to remove any lumps. Dip the apple rings, one at a time, into the batter. Tap apple rings against the side of the bowl to remove any excess batter. Gently place the rings in the hot oil and fry in small batches, turning so that they brown on both sides. Once the apple rings are golden and crispy, transfer to a paper towel-lined plate to remove excess oil. Dip each apple ring into the cinnamon sugar and coat evenly. Place on a wire cooling rack – setting the fried-and-coated rings on a plate will result in soggy apple rings! – and serve warm. So sweet and delicious! We love this idea, don’t you? Tell us what you think and if you give them a try!